Background: The aim of this study was to evaluate and compare the surface roughness of six esthetic restorative materials (Gradia Direct Anterior, GC Corporation, Tokyo, Japan; Filtek Supreme XTE, 3M ESPE, St. Paul, MN, USA; Ceram.X Universal, Dentsply DeTrey, Konstanz, Germany; Essentia enamel, GC Corporation, Tokyo, Japan; Admira Fusion, Voco, Cuxhaven, Germany; and Estelite, Tokuyama Dental corporation, Taitou-ku, Tokyo, Japan) achieved using three different finishing and polishing techniques. Materials and Methods: In this in vitro study Forty specimens of each material (6 mm in diameter, 2 mm high) were created and divided into four groups, one per each finishing and polishing procedure and a control group, only cured and not polished. All specimen preparation and finishing and polishing procedures were performed by the same investigator, to reduce variability, following strictly the manufacturer's instructions. Specimens were analyzed using a profilometer to measure the mean surface roughness (Ra, μm), and microscopy images were taken during the measurements through the microscope of the profilometer. Two-way ANOVA test was applied to determine significant differences with respect to material, finishing/polishing technique, and interaction between both variables. Post hoc comparison was done using Tukey's honestly significant difference test. Significance for statistical tests was predetermined at P < 0.05. Results: Finishing and polishing procedure using tungsten carbide burs provided the best values in terms of surface roughness. All materials of this study treated with this method have provided superimposable values, and no material can be considered more performing than the others. Similar values were also found in the control group. 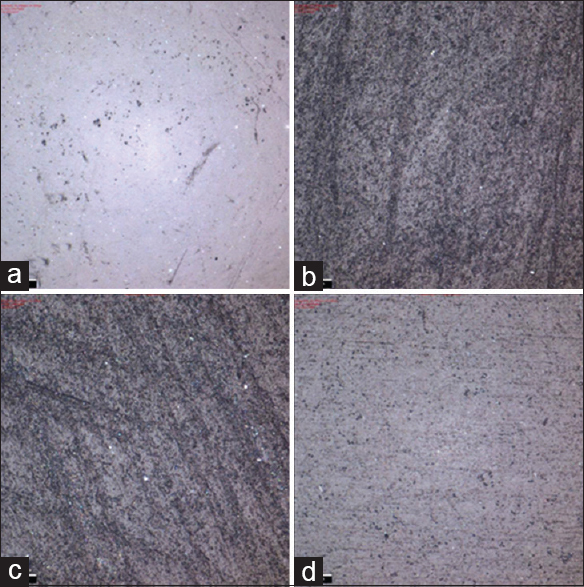 Conclusion: This study demonstrated that the finishing technique with carbide burs produced an excellent surface smoothness, even if the best surface smoothness is achieved curing the restorative material under a polyester matrix. Finishing and polishing procedures are important both from an esthetic point of view and a functional one. Obtaining a well-polished surface of restorative esthetic materials guarantees the esthetics of the restoration and it reduces dental plaque retention. The achievement of a smooth restoration surface is, therefore, a primary objective which reduces the amount of bacterial adhesion to the restorative material, and consequently, it reduces the secondary microinfiltration., Two factors affect the quality of polishing: the material used for restoration and the finishing and polishing procedures adopted. The aim of this in vitro study was to evaluate and compare the surface roughness of esthetic restorative materials achieved using different finishing and polishing techniques. In this in vitro study one microfilled composite (Gradia Direct Anterior, GC Corporation, Tokyo, Japan), one nanofilled composite (Filtek Supreme XTE, 3M ESPE, St. Paul, MN, USA), one nanoceramic composite (Ceram.X Universal, Dentsply DeTrey, Konstanz, Germany), one ultra-fine hybrid composite (Essentia enamel, GC Corporation, Tokyo, Japan), one nanohybrid Ormocer-based composite (Admira Fusion, Voco, Cuxhaven, Germany), and one supra-nano spherical hybrid composite (Estelite, Tokuyama Dental corporation, Taitou-ku, Tokyo, Japan) were evaluated [Table 1]. All materials were polymerized according to manufacturers' instructions into silicon rings (height 2 mm; internal diameter 6 mm; external diameter 8 mm) to obtain 40 specimens identical in size of each material. Cavities of rings were slightly overfilled with material, covered with transparent polyester film strip (Mylar Strip, Henry Schein, Melville, NY, USA), pressed between glass plates, and polymerized for 40 s on each side using a curing unit (Celalux II, Voco, Cuxhaven, Germany). One light polymerization mode was used for each material standard: 1000 mW/cm2 for 40 s. The intensity of the light was verified with a radiometer (SDS Kerr, Orange, CA, USA). The light was placed perpendicular to the specimen surface, at distance of 1.5 mm. A total of forty specimens of each esthetic restorative material were prepared. After polymerization, the specimens were stored in distilled water at 37°C for 15 days. 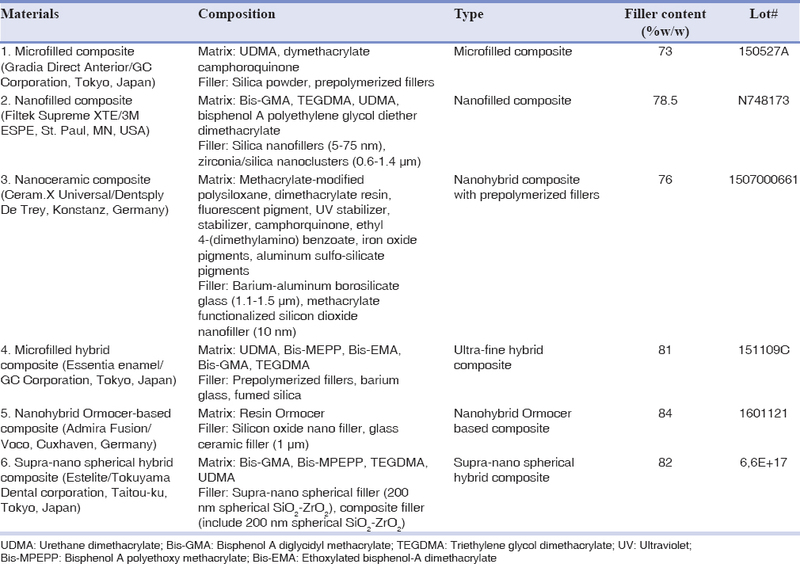 The specimens of different esthetic restorative materials were randomly assigned to four groups (10 specimens of each composite for each group): the upper surface of each specimen was finished/polished with different finishing/polishing procedures [Table 2]. Group 4: Polishing Kit 4546 – Komet Dental (H135Q 314,014, 9525UF 204,100) (Komet Brasseler GmbH and Co., Lemgo, Germany). The kit is composed by a carbide tungsten bur and a rubber polisher. All finishing/polishing procedures were performed by the same investigator, to reduce variability. All these procedures were performed strictly following manufacturer's instructions. At the end of the finishing and polishing procedures, all specimens were thoroughly rinsed with water and allowed to dry for 24 h at 20°C before the average surface roughness (Ra) was measured. A profilometer (Alicona Infinite Focus, Alicona Imaging GmbH, Raaba/Graz, Austria) was used to measure the surface roughness of specimens. Ra (surface roughness) was used as unit of measure in this process. Three different types of measurements (Ra) were recorded for each specimen; all the measures were taken from the middle of each specimen, giving a total evaluation length of 1 mm. The mean of all Ra measurement values was calculated for each specimen, and an overall Ra measure was calculated for the total sample group. Microscopy images [Figure 1], [Figure 2], [Figure 3], [Figure 4], [Figure 5], [Figure 6] were taken during the measurements through the microscope of the profilometer (optical measurement: noncontact, three-dimensional, based on Focus-Variation). 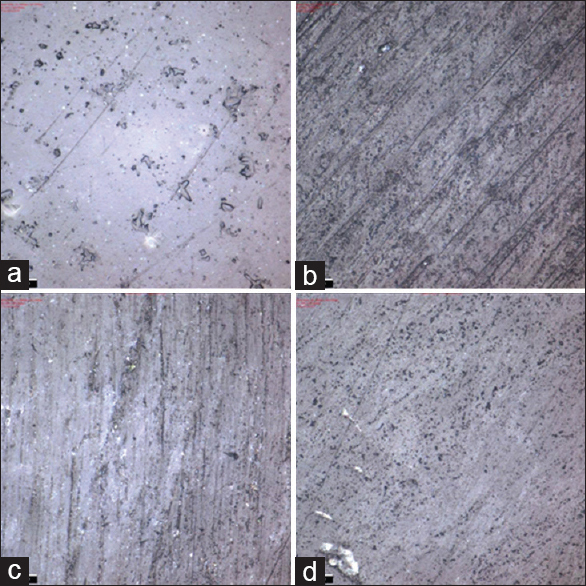 Figure 1: Microscopy images (×100) about surface morphology of Gradia Direct Anterior in control group (a), after polishing with REF 4312A (b), REF 4652 (c), and REF 4546 (d). Figure 2: Microscopy images (×100) about surface morphology of Filtek Supreme XTE in control group (a), after polishing with REF 4312A (b), REF 4652 (c), and REF 4546 (d). Figure 3: Microscopy images (×100) about surface morphology of Ceram.X Universal in control group (a), after polishing with REF 4312A (b), REF 4652 (c), and REF 4546 (d). 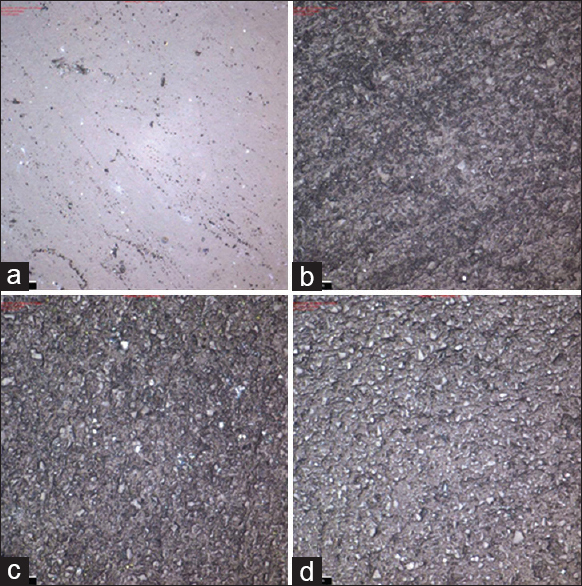 Figure 4: Microscopy images (×100) about surface morphology of Essentia enamel in control group (a), after polishing with REF 4312A (b), REF 4652 (c), and REF 4546 (d). Figure 5: Microscopy images (×100) about surface morphology of Admira Fusion in control group (a), after polishing with REF 4312A (b), REF 4652 (c), and REF 4546 (d). 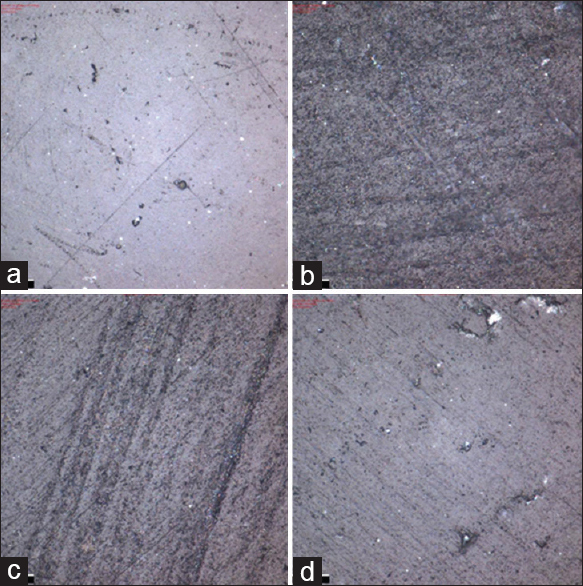 Figure 6: Microscopy images (×100) about surface morphology of Estelite in control group (a), after polishing with REF 4312A (b), REF 4652 (c), and REF 4546 (d). Statistical analysis was performed using computer software (Stata 7.0, StataCorp., Station College, TX, USA). Descriptive statistics including the mean, standard deviation, median, and minimum and maximum Ra values were calculated for each group. Shapiro–Wilk test was used to assess the normality of the distribution with alpha = 0.05. Two-way ANOVA test was applied to determine significant differences with respect to material, finishing/polishing technique, and interaction between both variables. Post hoc comparison was done using Tukey's honestly significant difference test. Significance for statistical tests was predetermined at alpha = 0.05. Ra values (μm) are presented in [Table 3]. The statistical analysis showed significant differences (P < 0.05) in Ra values for each composite when different finishing and polishing methods were applied [Table 4]. Group 1 (control group) had the lowest Ra values for all materials tested except for Estelite that showed the lowest values for specimens in Group 4 [Table 5]. Specimens of Gradia Direct Anterior, Filtek Supreme XTE and Ceram.X Universal treated with finishing and polishing technique included in Group 4 showed similar Ra values to Group 1 [Table 4] (P > 0.05). The finishing and polishing methods in Groups 2 and 3 provided worst results, respectively, for specimens of Gradia Direct Anterior, Admira, Estelite (Group 2) and Filtek Supreme, Ceram.X Universal and Essentia enamel (Group 3). When we considered groups as treatment in the ANOVA model, the Ra values recorded for Admira were the lowest in Group 1. Group 2 showed significantly higher roughness for all the materials [Table 2] and Filtek Supreme showed the highest Ra values, even for Group 3. Estelite showed the significantly higher smoothness for Groups 3 and 4. The effectiveness of finishing/polishing procedures on composite surface is an important goal to be achieved in the restorative process. Esthetic restoration can be imperceptible only if its surface closely resembles to the enamel surface. Two factors affect the quality of polishing: the material used for restoration and the finishing and polishing procedures adopted. As far as the material used is concerned, nano-ceramic composite resin has good mechanical properties with high esthetic features. Their structure is made by small particles clusters, and it gives the possibility to obtain surface smoother than the one obtainable with other materials. Previous studies have pointed out that the smoothest obtainable surface is obtainable by curing the esthetic material in direct contact with a polyester matrix (Group 1).,, The filler particle size significantly influences the final smoothness and gloss of restoration. The results of this study provide evidence of the fact that the smaller the filler particle size is, the easiest the polishing procedure is, because the surface area made by filler particles is reduced. For this reason, the only microfilled material (Gradia Direct Anterior) was not a well-performing material in terms of obtainable roughness in almost all the groups. On the other hand, as far as the procedures are concerned, among all the finishing and polishing methods investigated in this study, carbide burs (Group 4) are the one that provides the smoother surface and previous studies have confirmed the data obtained., Moreover, the results given by the finishing and polishing procedure by carbide burs can be compared to the ones of the control group. Tungsten carbide burs are more cutting efficient with respect to other finishing systems. Moreover, they provide a finer finishing degree and their finishing procedure is faster than the finishing procedures of the other materials. Tungsten carbide burs quickly and easily remove the surface imperfections that are present at the end of modeling procedure and simplify the polishing phase. The use of the rubber polisher with decreasing abrasiveness (Groups 2 and 3) both for the finishing phase and the polishing one is a technique which is not able to give a surface as smoother as the one obtainable with the other techniques described in this study. The least smooth surfaces obtained are those of Groups 2 and 3: the use of rubber polisher alone does not provide a sufficiently smooth surface with respect to the baseline. These results can be explained by the excessive rigidity of the rubber polisher and their gradual wear. The control group (Group 1) results highlight some differences in surface roughness: these differences are attributable to the different chemical nature of the components of each material and especially to the size of the filler particles. Although the surface of the composite materials is often sufficiently smooth after polymerization, the removal of exceeding material or the recontouring of restorations is often necessary. It is clinically important to identify the less time-consuming and material-consuming finishing technique which allows the clinician to obtain the smoothest surface. A literature review has pointed out that the surface roughness (Ra) of restorations should not be more than 0.2 μm in order to avoid an increase in bacterial adhesion to the restorative materials. Although this study highlights some statistically significant differences between different finishing and polishing techniques, the majority of the materials considered in this study show Ra values lower than the previously defined benchmark (0.2 μm). Considering all the limitations of this in vitro study, it is possible to state that tungsten carbide burs were the most effective ones among the finishing and polishing systems examined. For this reason, tungsten carbide burs are clinically recommended because they are cutting efficient and less time consuming than the other methods. Furthermore, this study highlights the effectiveness of nanofilled restorative materials to achieve the goal of a high level of smoothness. However, it is worth mentioning that further in vitro and in vivo studies on a larger sample of restorative materials are needed to obtain more reliable data. Lepri CP, Palma-Dibb RG. Surface roughness and color change of a composite: Influence of beverages and brushing. Dent Mater J 2012;31:689-96. Ferraris F, Conti A. Superficial roughness on composite surface, composite enamel and composite dentin junctions after different finishing and polishing procedures. Part I: Roughness after treatments with tungsten carbide vs. diamond burs. Int J Esthet Dent 2014;9:70-89. Ferraris F, Conti A. Superficial roughness on composite surface, composite-enamel and composite-dentin junctions after different finishing and polishing procedures. Part II: Roughness with diamond finishing and differences between enamel composite vs. body composite. Int J Esthet Dent 2014;9:184-204. Joniot SB, Grégoire GL, Auther AM, Roques YM. Three-dimensional optical profilometry analysis of surface states obtained after finishing sequences for three composite resins. Oper Dent 2000;25:311-5. Roque AC, Bohner LO, de Godoi AP, Colucci V, Corona SA, Catirse AB, et al. Surface roughness of composite resins subjected to hydrochloric acid. Braz Dent J 2015;26:268-71. Poggio C, Lombardini M, Dagna A, Scribante A, Chiesa M. Effect of various finishing and polishing systems on surface roughness of composite resin: A profilometric study. Ann Stomatol 2006;4:61-5. Avsar A, Yuzbasioglu E, Sarac D. The effect of finishing and polishing techniques on the surface roughness and the color of nanocomposite resin restorative materials. Adv Clin Exp Med 2015;24:881-90. Pirani C, Gullifa A, Marchionni S, Piana G. New methods to finish composite restorations: SEM evaluation. Ital J Oper Dent 2004;2:234-6. Barbosa SH, Zanata RL, Navarro MF, Nunes OB. 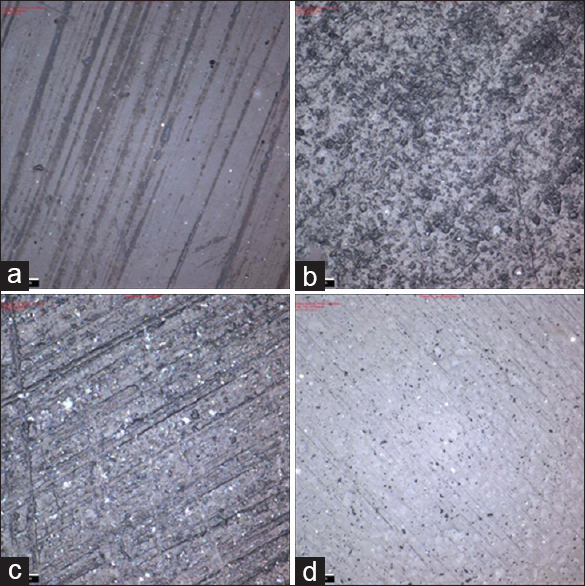 Effect of different finishing and polishing techniques on the surface roughness of microfilled, hybrid and packable composite resins. Braz Dent J 2005;16:39-44. Sahbaz C, Bahsi E, Ince B, Bakir EP, Cellik O. Effect of the different finishing and polishing procedures on the surface roughness of three different posterior composite resins. Scanning 2016;38:448-54. Attar N. The effect of finishing and polishing procedures on the surface roughness of composite resin materials. J Contemp Dent Pract 2007;8:27-35. 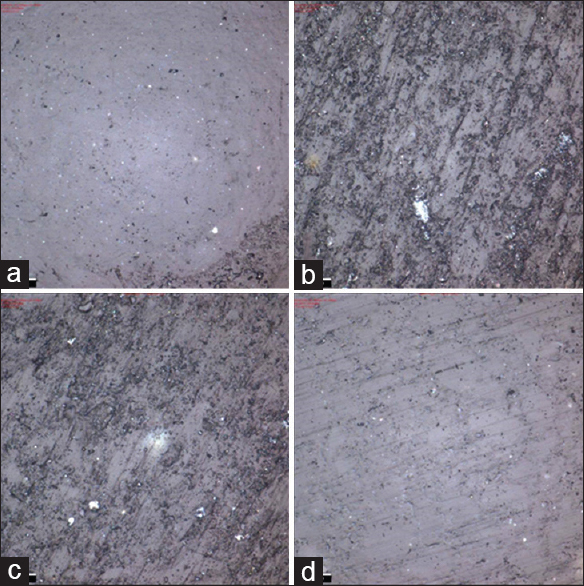 Yadav RD, Raisingani D, Jindal D, Mathur R. A comparative analysis of different finishing and polishing devices on nanofilled, microfilled, and hybrid composite: A scanning electron microscopy and profilometric study. Int J Clin Pediatr Dent 2016;9:201-8. Antonson SA, Yazici AR, Kilinc E, Antonson DE, Hardigan PC. Comparison of different finishing/polishing systems on surface roughness and gloss of resin composites. J Dent 2011;39 Suppl 1:e9-17. Marghalani HY. Effect of finishing/polishing systems on the surface roughness of novel posterior composites. J Esthet Restor Dent 2010;22:127-38. Lemos CA, Mauro SJ, Dos Santos PH, Briso AL, Fagundes TC. Influence of mechanical and chemical degradation in the surface roughness, gloss, and color of microhybrid composites. J Contemp Dent Pract 2017;18:283-8. Kemaloglu H, Karacolak G, Turkun LS. Can reduced-step polishers be as effective as multiple-step polishers in enhancing surface smoothness? J Esthet Restor Dent 2017;29:31-40. Reis AF, Giannini M, Lovadino JR, Ambrosano GM. Effects of various finishing systems on the surface roughness and staining susceptibility of packable composite resins. Dent Mater 2003;19:12-8. Ozgünaltay G, Yazici AR, Görücü J. Effect of finishing and polishing procedures on the surface roughness of new tooth-coloured restoratives. J Oral Rehabil 2003;30:218-24. Roeder LB, Tate WH, Powers JM. Effect of finishing and polishing procedures on the surface roughness of packable composites. Oper Dent 2000;25:534-43. Gedik R, Hürmüzlü F, Coşkun A, Bektaş OO, Ozdemir AK. Surface roughness of new microhybrid resin-based composites. J Am Dent Assoc 2005;136:1106-12. Ryba TM, Dunn WJ, Murchison DF. Surface roughness of various packable composites. Oper Dent 2002;27:243-7. Bollen CM, Lambrechts P, Quirynen M. Comparison of surface roughness of oral hard materials to the threshold surface roughness for bacterial plaque retention: A review of the literature. Dent Mater 1997;13:258-69.